About 400 protesters gathered outside the Statehouse on Saturday to support a recount of the presidential election votes in Ohio and call for an investigation into Election Day irregularities. Speakers addressing the crowd alleged that many voters were the victims of a fraud in which votes intended for John Kerry were given to President Bush. "I would like to welcome you to the Ukraine," said Susan Truitt, referring to the country where a new presidential runoff election was ordered after observers said the first one was rigged. On Friday, a federal judge in Columbus ruled that a recount may proceed if two minority party candidates who sued for it can pay for it. Green and Libertarian party officials say they can. 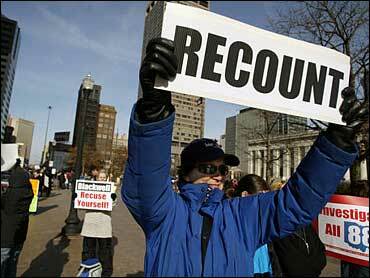 A recount would likely not begin before Dec. 13, when Ohio's 20 electoral votes are officially counted. Kerry would have won the presidency had he carried the state's 20 electoral votes. He conceded the day after the election, saying there were not enough provisional and other ballots to swing the results his way. Mr. Bush won the state by about 119,000 votes, or 2 percentage points, according to an analysis of county board of elections results by The Associated Press. Critics say Ohio's numbers are suspect because of several irregularities on election night. Those included disparities in the vote totals for different Democrats on the same ballot and the disqualification of more than 90,000 presidential votes on punch-card ballots because the choices could not be determined. A computer glitch on election night also recorded an extra 3,893 votes for Mr. Bush in one precinct in suburban Gahanna. "There was no doubt in my mind that Kerry had enough votes. My fear was the votes would not be counted and that's been borne out," said Melissa Hedden, one of the protesters. State and county election officials have said there were irregularities on Nov. 2, but no more than in any other election. They adamantly have denied there is any evidence of widespread wrongdoing. The Kerry campaign has joined the lawsuit seeking a recount. Officials said they are not disputing the outcome of the race but want to make sure any recount is "done accurately and completely."